Hamish Marshall top-scored with 70 as Gloucestershire put their noses in front on first innings on day two against Glamorgan at St Helen's. 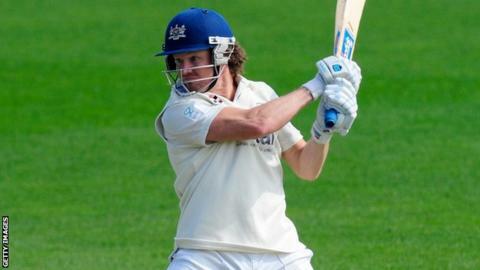 The New Zealander shared a fourth-wicket stand of 129 with Benny Howell (67) as they reached 301-6 at stumps. Paceman Craig Meschede took 3-70 for the home side, who were all out for 299 during the morning session. Andrew Salter failed to add to his overnight 73, but Kieran Bull made 31 before falling to David Payne (4-73). Gloucestershire lost their first two wickets before lunch and acting skipper Will Tavare followed when he was caught at short-leg for 47 from Salter's off-spin. Marshall, back in the side for the first time in almost a month after being called up when Craig Miles pulled out injured, hit a six and 11 fours before he was lbw to Michael Hogan as the visitors slumped from 240-3 to 262-6 in 10 overs. But Miles Hammond (17 not out) and Jack Taylor (22 not out) saw them past 300 to secure a third batting point just before the close, with the umpires ruling that an edge to slip by Taylor from the last ball of the day had not carried. "I don't think we bowled particularly well in the first two sessions, I think the pitch was offering enough with the ball, but I think we came back nicely in that last session. "I think if we can just keep that up, keep the momentum going forward, we can get a couple of wickets and run through them. "